This paper examines the role of dominant transportation technologies in managing the mobility needs of differently sized cities in India and draws implications that are similar for other countries in developing Asia. By 2050, continued urbanization will add 2.5 billion people to today’s worldwide urban population, with nearly 90% of the growth concentrated in Asia and Africa. India, China, and Nigeria together will account for nearly 37% of the estimated increase of the total urban population. In order to ensure that the benefits of urbanization are equitably distributed, strong policy instruments are required. Emerging economies where much of the infrastructure is yet to be built offer a unique opportunity for low-carbon development. This is especially true in the case of the transportation sector. Designing cities for public transportation, walking, and cycling can offer affordable ways to meet mobility demands and cut global pollutants. Choosing an appropriate transportation technology can significantly affect the spatial structures of cities and ensure a more sustainable form of development. While large and medium cities can be designed for public transportation, smaller cities can be designed for active modes—cycling and walking. Using the case study of Bangalore, we demonstrate that opting for a balanced modal share (as opposed to the private automobile as the dominant mode) can reduce vehicle-kilometers traveled by 71 million and transportation sector carbon dioxide emissions by 5.3 million tons. One size does not fit all. Small cities less than 50 square kilometers in area do not require heavy public transportation investments; investments in active modes would be more appropriate. By contrast, medium and larger cities require investments in public transportation and should consider concentrating development along transit corridors. Transit-oriented development. A key advantage of public transportation systems is that they can support higher densities through more efficient movement of passengers. In order to promote transit-oriented development in India, it is essential that the performance of public utilities, which are the major providers of the country’s urban infrastructure, be improved and linked to land-management strategies. Investment in public transportation and active modes. City governments in India can now set aside funds for non-motorized transportation as part of their roads budgets. Some cities, such as Chennai, have constituted laws that require a portion of the roads budget to include non-motorized transportation, and such programs need to be scaled up across the country. Improvements to fuel efficiency. With two sets of emission standards—one for large cities and another for the rest of the country—purchase of vehicles (especially heavy commercial vehicles) now occurs mostly outside the large cities. 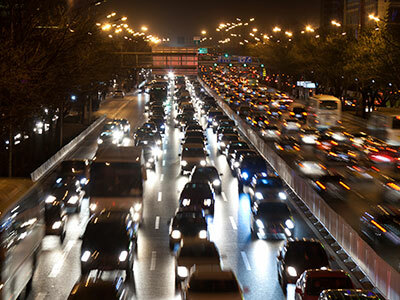 Harmonizing emission standards, along with making fuel quality uniform across the country, is critical to mitigate air pollution and improve public health. Srikanth Shastry is a Manager at the World Resources Institute Ross Center for Sustainable Cities. Madhav Pai is the India Director for the World Resources Institute Ross Center for Sustainable Cities.